"A breathtaking, brilliant dash through twenty years of history, no holds barred, just the way it should be"
Oded Golan gets back the tablet, which may be the only known remnant of Solomon’s Temple, after an 11-year legal battle with Israel Antiquities Authority. An inscribed stone that may be the only remnant of Solomon’s Temple has been returned to its owner after an 11-year legal battle waged by the Israeli government. 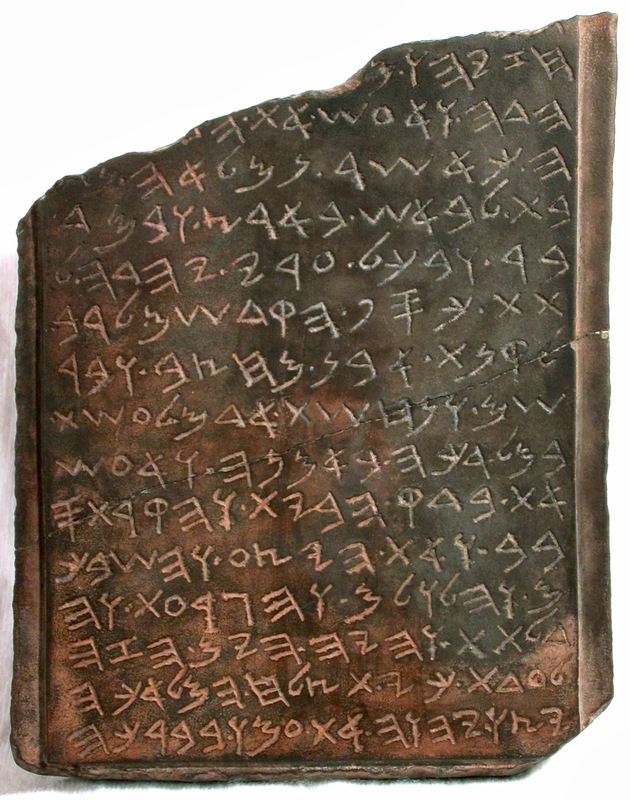 The Jehoash Tablet, also known as the “Bedek Habayit” inscription, is back in the hands of Tel Aviv collector Oded Golan, who plans to put it on public display in a major museum. Golan finally retrieved the tablet and hundreds of other items more than two years after he was acquitted of forging priceless antiquities in a seven-year criminal trial and nearly a year after the High Court finally rejected a last-ditch appeal by Israel's state attorney and the Israel Antiquities Authority. After more than a decade of confrontation, Golan tells me he does not wish to be rushed into his next move. “But it should go on display in a major museum so the public can see it for themselves, together with all the test results carried out before and during the trial,” he says. Limestone burial box is typical of first century Jerusalem and has chiselled on side "James, son of Joseph, brother of Jesus"
For 2,000 years, pilgrims and archaeologists have hunted for physical evidence of Jesus and his family, without success. But now an ancient burial box claiming to contain the earliest reference to the Christian saviour is about to go on public display in Israel after its owner was cleared of forgery. It has not been seen in public since a single, brief exhibition in Toronto in 2002. 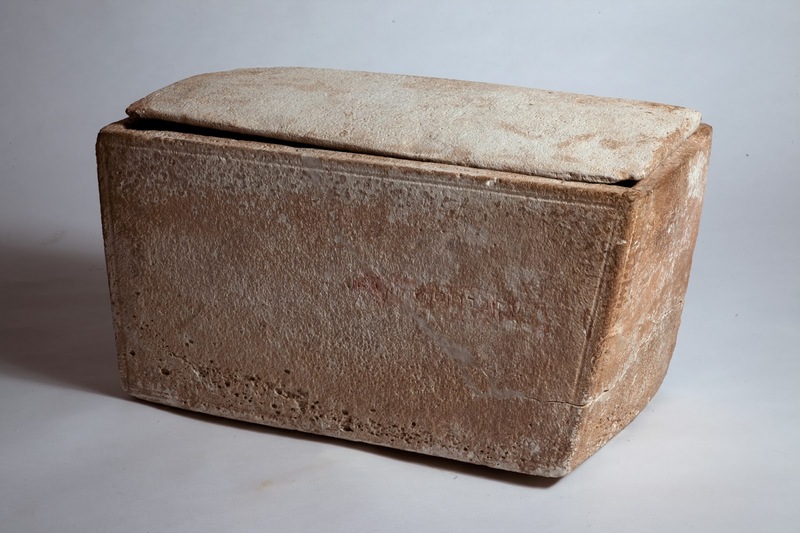 The modest limestone burial box, known as an ossuary, is typical of first century Jerusalem, and is owned by Oded Golan, an Israeli antiquities collector. Chiselled on the side are the words "James, son of Joseph, brother of Jesus." James the Just was the first leader of the Christians in Jerusalem after the Crucifixion. He was executed for apostasy by the local rabbinical court. At that time, Jews were not buried but laid in a cave. The bones were collected after a year and placed in an ossuary. Thousands have been discovered, some of them inscribed with names to identify whose bones they contain. One other ossuary mentions a brother. "This is the oldest evidence that mentions the name of Jesus Christ," said Golan, who bought the box in the 1970s but did not realise its significance until Sorbonne Professor Andre Lemaire noticed it in Golan's collection. Lemaire published his findings in 2002 and the ossuary was briefly displayed at a Toronto museum, causing a worldwide sensation. But sceptics questioned its authenticity. In 2003, the Israel Antiquities Authority seized the ossuary and appointed an expert committee who dubbed it a fake. Golan was arrested and charged with forging the mention of Jesus. 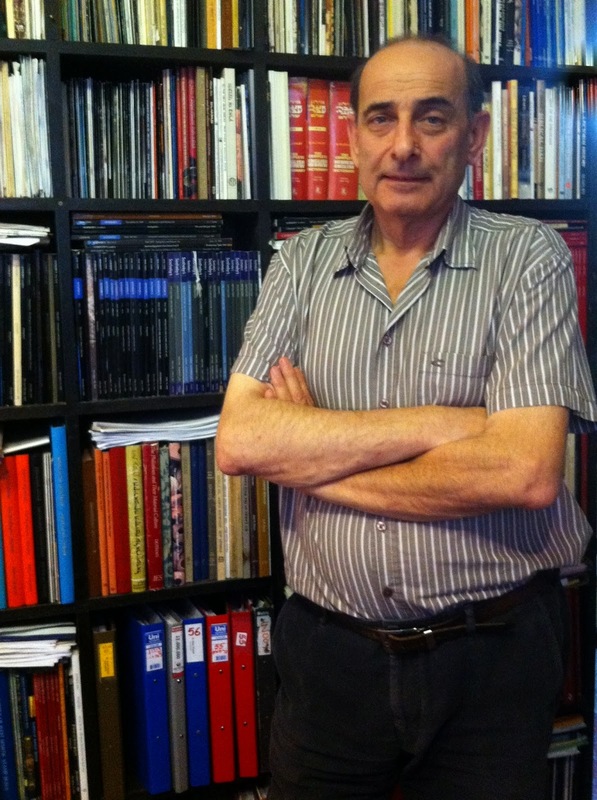 After a 10-year investigation and criminal trial, Golan was found innocent of forgery in 2012. Despite the verdict, doubts remain. 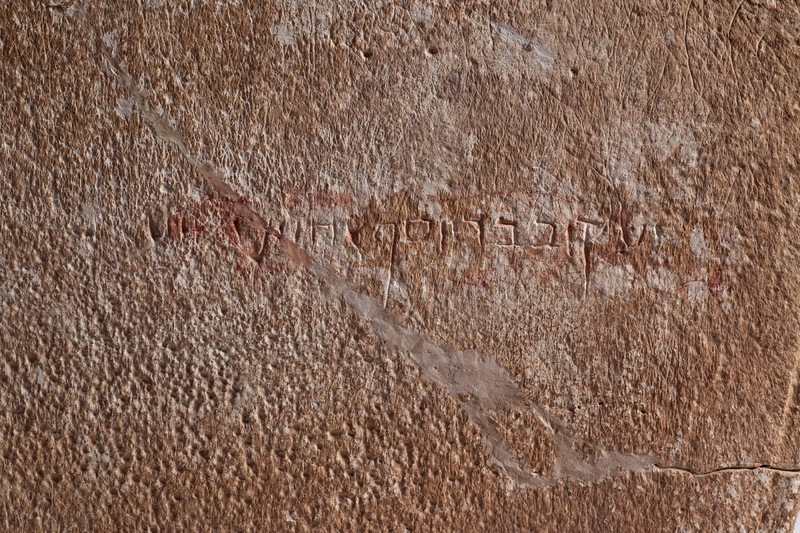 "Because of the differences in the depth and the clarity and the kerning between the first half of the inscription that mentions James son of Joseph, and the second half, I'd be willing to wager that the second half was added in modern times," said Professor Christopher Rollston of the Albright Institute of Archaeological Research in Jerusalem. "The inscription is written in the Jewish script, it was done with a sharp instrument and I think it was done by the same hand. It is an authentic inscription," said Professor Gabriel Barkay of Bar-Ilan University. 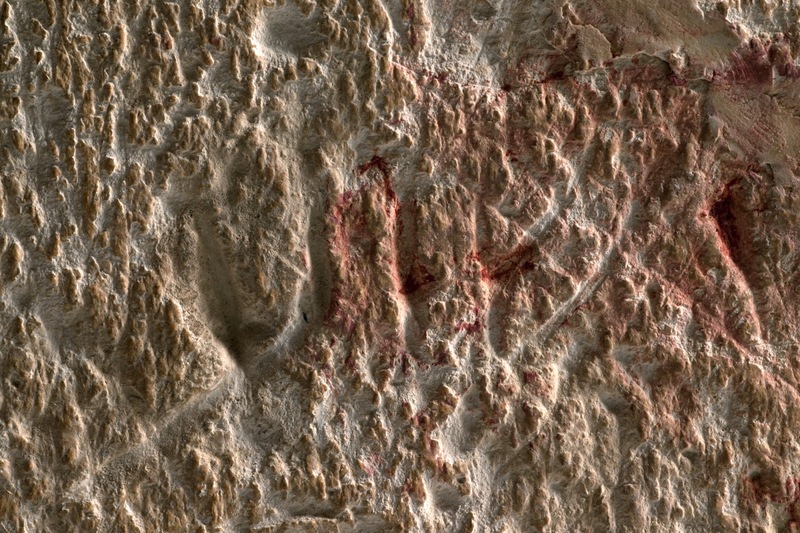 Golan cites expert evidence from the trial showing the patina - a biological crust formed on ancient objects - inside the grooves of the inscription. "There is no doubt that it's ancient, and the probability is that it belonged to the brother of Jesus Christ," said Golan. Although Golan's trial ended last year, the ossuary was returned only a few weeks ago by the Israel authorities. 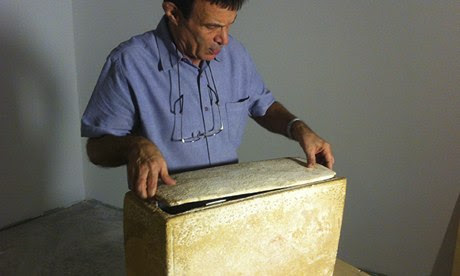 Golan plans to put it on public display, together with the expert opinions from the trial, so that scholars and the public can decide for themselves whether this box did truly contain the bones of the brother of Christ – a unique piece of concrete evidence of the family of Jesus. Suit says that the police investigation, lengthy trial and public denunciation by officials nearly dealt a death-blow to Deutsch’s academic career and caused the loss of millions of dollars in past and future business. Nearly two years after the spectacular collapse of the Jerusalem archaeology forgery trial and his sweeping acquittal on all charges, Robert Deutsch, proprietor of the Archaeological Center in Old Jaffa, has filed suit demanding more than $3 million in damages from the Israel Antiquities Authority, the Jerusalem District Attorney and individual officials behind the 10-year prosecution. Deutsch, one of the most prominent antiquities dealers in Israel, was acquitted in March 2012 on all six charges against him after being accused of “forgery with the intention of aggravated fraud” of various artifacts together with Tel Aviv antiquities collector Oded Golan and others. 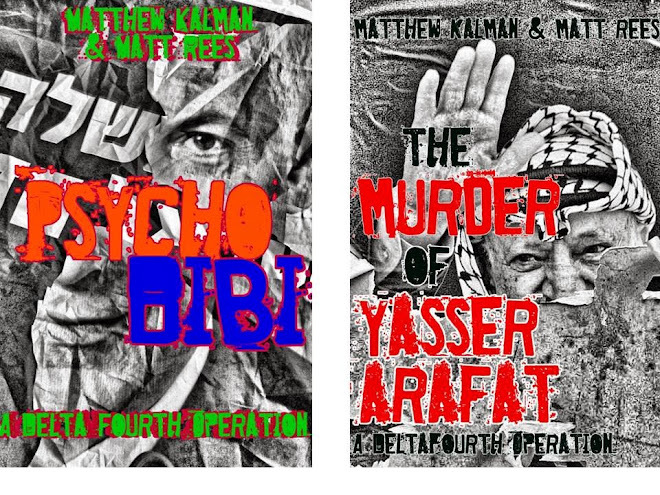 Deutsch filed suit on 28 November in the Tel Aviv District Court against the Israel Antiquities Authority, its director Shuka Dorfman, the head of its anti-theft unit Amir Ganor, the Jerusalem District Attorney and Assistant District Attorney Dan Bahat who led the prosecution. He is seeking 12 million shekels ($3.4 million) in damages – an astronomical sum for Israel. In an interview, Deutsch said the multi-million-dollar damages demanded were “a drop in the ocean” compared to the wreckage wrought to his reputation and business by the affair. Deutsch was never accused of any involvement with the alleged forgery of either the James Ossuary or Jehoash Tablet, but when those items propelled the sprawling, 18-count indictment sheet into the headlines, as the main co-defendant his name was yoked to the allegations against Golan. It could be the earliest inscription of the word “Jesus” ever found, but we may never know. In their fruitless zeal to prove that the inscription “James, son of Joseph, brother of Jesus” was forged by Oded Golan or an Egyptian craftsman working under his direction, the Israel Antiquities Authority permitted a series of destructive tests that proved nothing and may have destroyed the chances of ever knowing the truth. The worst contamination can be seen in the reddish stain now smeared across the word “Yeshua” (Jesus) in the photograph above. The Israel Police Forensics Laboratory applied red silicon to the inscription to create a mold that might show it was a modern addition. The procedure proved nothing, but it left reddish stains in the grooves of the letters and ripped out the ancient patina that covers archaeological items and helps determine their authenticity. 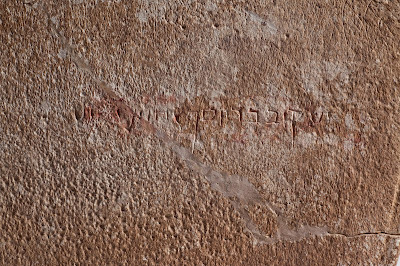 “In the summer of 2004 the Israeli police, with permission of the IAA, made a red silicon mold of the inscription destroying the 'letter patina' by pulling out this 'soft' patina which cannot be observed anymore, thus, destroying evidence. Consequently, the alleged small amount of masking letter patina is absent now and cannot be studied further,” observed Amnon Rosenfeld and Shimon Ilani, the geologists who first studied the ossuary before it was revealed to the public in 2002. Superintendent Yehudah Novoslaski, deputy for signs and material in the Forensic Department of the Israeli Police, told the Jerusalem District Court that he produced a silicon mold and photographed it. “I found differences in the engraving tools between the first part of the inscription ‘Ya’akov Bar Yosef’ and the second part ‘brother of Yeshua’,” he told the court. But the judge was not convinced. “There is no dispute that the casting of the silicon by the forensics people changed the physical condition of the inscription of the ossuary,” said Judge Farkash. There was some confusion as to how the silicon mold came to be made. Jonathan Pagis, the police officer who led the investigation, told the court he asked the forensics laboratory to “examine” the ossuary, not to carry out invasive tests. Pagis said he gave no orders for the mold to be taken. The silicon casting “polluted” the ossuary, said Orna Cohen, a member of the IAA committee of experts that ruled the ossuary was a fake, but ended up testifying for the defense. Judge Farkash concluded that, far from assisting the prosecution, the forensic damage had hampered the defense case to such an extent that it actually worked to the advantage of Golan. Oded Golan said he would check the damage to the ossuary and see if can be restored. “It’s not in the same condition as before the trial. The inscription was defaced, contaminated. They poured red silicon into the inscription and they let it dry and when they took it out they took the patina. It’s ruined. I have to evaluate the damage, see if it can be restored and if there is the possibility of carrying out further tests on the inscription in future that will allow us to show its authenticity. The government said the second half of the inscription was forged – the words “brother of Jesus” – and that’s where the major damage has been done,” Golan said. TEL AVIV — A modest limestone casket could be the first object ever found from the family of Jesus Christ. The stone burial box bearing the inscription "James, son of Joseph, brother of Jesus" has been hidden from public view at the Israel Antiquities Authority since 2003. Tel Aviv antiquities collector Oded Golan retrieved the burial box from the Israel Antiquities Authority. But now it has been released to be displayed around the world, following a 10-year legal battle in which Israeli authorities failed to show that Tel Aviv collector Oded Golan faked the ancient Aramaic lettering on the box. Golan bought the box for a pittance in the 1970s from an East Jerusalem antiquities dealer and had it for more than 25 years before Sorbonne professor Andre Lemaire pointed out the staggering significance of the letters scratched in the side. "I never knew that Jesus had a brother," said Golan. The box is just 20 inches long and one foot wide, carved from a single piece of reddish limestone with a flat lid — typical of the burial boxes used by the Jews of first-century Palestine. It was last displayed in Toronto in 2002, causing a worldwide sensation. But the celebrations were short-lived. The Israeli Antiquities Authority seized the ossuary, and its experts said the words "brother of Jesus" had been added to the original inscription. Golan was arrested in 2003 and put on trial. 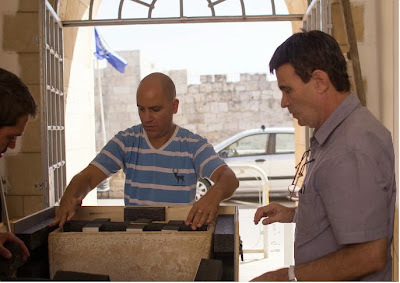 Tel Aviv antiquities collector Oded Golan retrieving the burial box with the inscription 'James, son of Joseph, brother of Jesus' from the Israel Antiquities Authority. The IAA seized and held the box throughout a ten-year investigation and trial. Golan was acquitted in 2012. In March 2012, Golan was acquitted of forgery, but some experts still maintain the box is a fake. Golan and other experts are convinced it is the real thing. 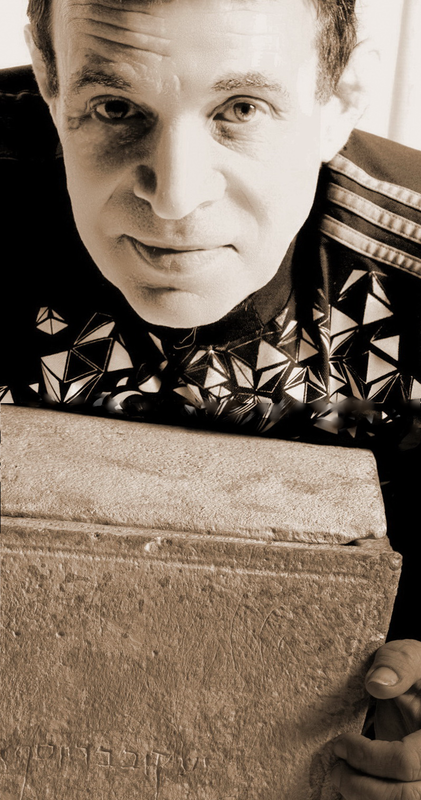 In an exclusive interview Golan said it is time for people to hear the whole story. "The inscription is ancient for sure. We proved that at the trial,” he said. “It's time to have this debate in a public exhibition, and let people decide for themselves." In their zeal to prove their allegations, the Israeli authorities may have wrecked the chances of conclusive scientific tests. "It's not in the same condition as before the trial. The inscription was defaced, contaminated,” Golan said. “I have to evaluate the damage, see if it can be restored and if there is the possibility of carrying out further tests on the inscription in future that will allow us to show its authenticity." Golan says he won't be parting with it again - no matter how much he is offered. “In the long term it will remain in Israel," he vowed. The Israel Antiquities Authority has failed in its last-gasp attempt to confiscate the controversial Jehoash Tablet from Israeli collector Oded Golan. In a verdict handed down on Wednesday, the three-judge appeal panel of Supreme Court justices decided by 2-1 that the inscribed tablet must be returned to Golan, who was acquitted last year of forging after a ten-year prosecution and trial. The Supreme Court ruling caps a crushing defeat for the Israel Antiquities Authority following the sweeping 2012 acquittal of Golan and dealer Robert Deutsch on multiple charges of archaeological forgery. Israeli prosecutors advised by the Israel Antiquities Authority had argued that even though they continue to believe the inscription is a modern forgery, the reverse of the stone had been “dressed” in ancient times and was therefore classified as an antiquity that should belong to the state. But those arguments were rejected by the majority decision of the court. Oded Golan is now poised to reclaim both the tablet and the more famous item, the James ossuary, along with dozens of pieces confiscated by the Israel Antiquities Authority and the Israeli police at the time of his arrest in 2003. Golan greeted the decision as “good news.” He says he plans to put both the ossuary and the tablet on public display. The latest about-turn could be the final twist in a nail-biting finale to the decade-long pursuit of Golan. However, a sternly-worded ruling by the same court in September suggests that the battle over the future of the antiquities trade is just beginning. In an 8,000-word ruling handed down on September 29, a panel of three Supreme Court Justices rejected Golan’s appeal against his conviction and sentence on three minor charges and used the opportunity to declare war on the antiquities market. Branding the trade in antiquities “damaging” and motivated by “avarice,” the ruling authored by Supreme Court Justice Daphne Barak-Erez depicts “a world of collectors exchanging treasures teeming with trembling hands and heart - often within the law, and sometimes without,” and notes with approval that “in most countries of the world there is a general ban on the trade in antiquities, because of their recognition as a national resource.” She further observed, that this "conception also serves as the basis for the antiquities law” in Israel. The ruling places the Supreme Court on a potential collision course with the Israel Museum and other major archaeological collections in the country, which all display items purchased from the market. Israel Museum curators and experts have described a complex and well-oiled procedure of verification and testing carried out in the museum laboratories to determine the significance and authenticity of items offered by dealers. Many of the Israel Museum’s most notable archaeological exhibits, including the Dead Sea Scrolls, royal seal impressions and coins were purchased on behalf of the museum from the antiquities market and not discovered in authorized archaeological excavations. 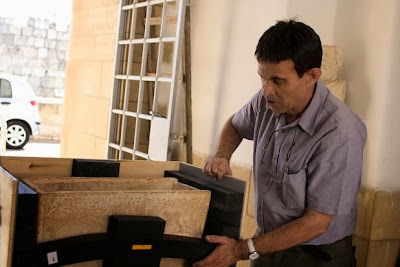 Oded Golan, the Israeli antiquities collector who was acquitted of forging the Jehoash Tablet after a seven-year criminal trial, said he had offered to loan it to a museum for study and public display, but he would fight the attempts by the state to confiscate it. 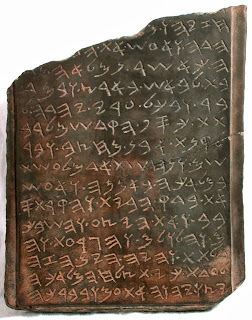 The rectangular black stone Jehoash tablet - about 12 inches long, 10 inches wide and just over 3 inches thick - is inscribed with a chiselled inscription of 15 lines in ancient script similar to a famous passage from the Second Book of Kings recording repairs made by King Jehoash to the Temple of Solomon in Jerusalem around 800 BCE. If authentic, it is the only item yet found that may have come from Solomon's Temple, built around the 9th century BCE and destroyed by the Babylonians 300-400 years later. Golan was acquitted of all forgery charges in March 2012, nine years after he was first arrested on suspicion of forging the inscription. He was also acquitted of forging the words “James, son of Joseph, brother of Jesus” on a stone burial box, and dozens of other items including seal impressions linked to biblical figures, inked inscriptions on pottery sherds and a richly-decorated ancient stone lamp. The Jehoash Tablet has never been displayed in public – except in the Jerusalem District Court of Judge Aharon Farkash. It was seized by Israeli police in 2003 together with hundreds of other items, including the James ossuary, in a series of raids on Golan’s home, office and warehouses. Following Golan’s arrest, a panel of experts appointed by the Israel Antiquities Authority declared the Jehoash Tablet and the James ossuary fakes. Golan and four others were indicted in December 2004 on multiple counts of forgery and accused of being members of an international antiquities forgery ring. None of the charges held up in court. A year after Golan’s acquittal, Judge Farkash ordered the prosecution to return the Jehoash Tablet, the James ossuary and the other items to Golan. But after arguing for a decade that the Jehoash Tablet was a fake, the prosecution has suddenly decided it is an antiquity, and therefore the property of the state under the 1978 Israel Antiquities Law. The stunning about-turn – from branding the tablet a fake and pursuing a decade-long witchhunt for its forger, to deciding that it was a valuable antiquity that must only be under control of the Israeli state – has become the central plank of the government appeal now before Israel’s high court. The Israeli government is effectively demanding that Golan be punished despite being acquitted by confiscating the Jehoash tablet. In a scathing departure from his usually cautious comments throughout the case, Judge Farkash accepted that the return of the Jehoash Tablet should await the appeal decision by the high court, but he pointedly dismissed the prosecution argument. “The state insisted on its view that this was not an antiquity, but a forged antiquity. Since, according to the state, it is not an antiquity, it cannot now contend that it owns the tablet according to the Antiquities Law, and therefore by law it should be returned to Golan,” Farkash wrote in a decision issued on February 12, 2013. The words for “ancient” and “antiquity” are the same in Hebrew: atiqa. The judges pointedly asked how the prosecution could reverse its earlier argument that the tablet was fake, including evidence from its own expert witness that the stone was recently inscribed and came from abroad. 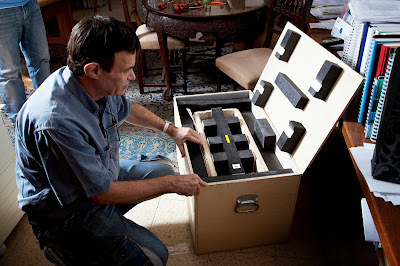 They also wondered how the prosecution could argue that the stone came from Israel, and so belonged to the state, when the only evidence attesting to its origins was hearsay defence evidence that the antiquities dealer who sold it to Golan told him it had been discovered in the late 1990s near the Temple Mount in Jerusalem. Throughout the trial, the prosecution had branded that evidence as manufactured to try and prove the authenticity of the item. She suggested that sometime in the future, it may be discovered to be genuine. “It is unthinkable that such an item should be in private hands,” she told the court. An archaeologist sitting in the public gallery during the hearing laughed out loud at the prosecution argument, pointing out that all stones are “ancient,” since they were created millions of years ago. It was only the addition of the inscription that transformed an “ancient” stone into an “antiquity” – an inscription that the prosecution continues to denounce as fake. But the judges were apparently smitten with the tablet and asked for it to be produced in court so they could handle it themselves. The tablet was once offered for sale to the Israel Museum for four million dollars. It was broken in two while in the custody of the Israel Antiquities Authority and was brought to court in a plain wooden box, protected by plastic wrap. After adjourning to chambers to discuss the issue, the judges returned and, defying the logic set out in Judge Farkash’s decision, suggested a compromise whereby the state would keep the Jehoash Tablet and negotiate returning more than 250 other items seized from Golan. “Now, after they failed to destroy me, they expect me just to give them the very item they said I faked. The offer suggested by the court will not happen. I will negotiate with the prosecution and try to offer some other possibilities and hopefully the high court will accept it,” he said. It was billed as the Trial of the Century. Five men, among them the most respected antiquities experts in Israel, went on trial in 2005 accused of faking a series of priceless artefacts and conspiring to sell them to museums and collectors around the world. Seven years, 100 witnesses and 12,000 pages of testimony later, only two defendants were left. Did these men really fake the burial box of Jesus's brother, a monumental First Temple inscription commissioned by King Jehoash, seals, inscribed stone and pottery vessels, a stunning engraved stone oil lamp and other priceless items? Or have the Israel Antiquities Authority and the Israel police subjected innocent men to a five-year, multi-million-dollar, career-breaking witchhunt? Even though this trial could change everything we think we know about the Bible and the life of Jesus, only one reporter has followed it day to day. MATTHEW KALMAN co-authored the first published story on the James Ossuary for TIME magazine in 2002 and has since reported on the case for the Globe & Mail, BBC, CTV, the Discovery Channel, Boston Globe and San Francisco Chronicle. He is the only journalist covering the trial. A collection of essays published in 2009 and edited by Ryan Byrne and Bernadette McNary-Zak assumes from the start that the ossuary is a forgery. The research is sloppy - apparently based largely on press cuttings - and there are some woeful errors. Hershel Shanks is re-dubbed "Herschel"